We admit it – patience has been hard with waiting for the upcoming all-new 5th generation Supra. The announcement of a joint product to be designed with (and built by) BMW has been testing our patience. We’ve eagerly been watching the spy photos and waiting for a sign from Toyota of the production car. Now, finally, we have one – although not at all what we were expecting. At the Geneva show we – and most of the automotive enthusiast world – had hoped for a production reveal. Instead we got a reveal of a racecar built on the new Supra foundation, to be campaigned by Toyota Gazoo Racing. So it’s a start in the rollout to production, and a fair one. And perhaps a necessary one: Supra fans believe that they have cracked the code and discovered that the new Supra is also BMW powered… so it’s necessary to establish the cred of the new Supra and what way to do it better than by revealing a racecar built on the bones of the new Supra (although the race car’s powerplant is unknown). And at least we now know the size of the car: 180 inches in length: much shorter than the last Supra (which was a 4-seater built on a chassis shared with a 4-door sedan). Personally, here’s where we’d like to be in a few years. 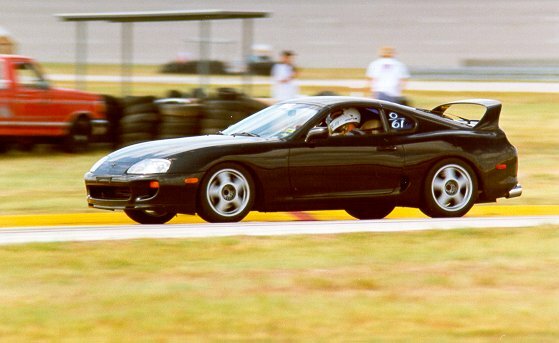 This is one of our editors 20 years ago in a modified Supra TT, coming into the carousel at Texas World Speedway. Both the car and the track are gone… but a new Supra is on finally the way! Visit the Driving Enthusiast Pinterest Site (featuring 20,337 Pins and 140 Boards) – and our Toyota Supra Board featuring 181 Pins and now covering all 5 generations! Toyota FT-1 Concept: finally a Supra?